That long weekend in which I perfected pizza crust, sourdough bread AND the biscuit? Well it turns out that even if you do work out 5 days a week and can eat your weight in carbs thanks to your good Irish genes, a massive overdose on white flour where one eats the better part of a pizza one day followed by at least an entire loaf of sourdough baguette a few days later and follows that up with 4 biscuits at dinner the next night with 2 for breakfast the morning after over a 5 day span will result in a muffin top just like your girlfriends warned you about once you are at a certain age, which apparently I now am. So, after hitting the gym hard and watching my carb intake, especially my not-quite-entirely-healthy carb intake and getting that waistband on my jeans to fit like it should, I was ready to get back on that biscuit project. As I stated in my last post about biscuits, I want to come up with a whole grain biscuit that is light, fluffy, tasty AND easy on my waist line no matter how many I eat in one sitting. I’ve spent serious time reading and talking with my other foodie friends about types of flour and fat and had a few ideas I wanted to try out. I also acquired an assistant in my mission. After watching countless hours of Julia Child and Jacques Pepin, along with a little bit of bow tie guy that she won’t admit to watching (She claims to not like him and last week’s profile in New York Times Magazine with the title “Cooking Isn’t Creative and It Isn’t Easy” sent her on a good 20 minute tirade of how that’s exactly why she cannot. stand. him.) on PBS’s Create channel, my girl decided she wanted in on the great biscuit project. So, I measured out the flour proportions I wanted to try and she took over, with a small assist from me on working in the butter. The recipe we used calls for 3 cups of flour. We did one cup whole wheat, one and a half cups all purpose flour and a half cup cake flour. For the fat, we did equal parts lard and butter. We cut the lard in first and the butter second. The biscuits themselves were light and slightly crumbly. I think the flour mixture was spot on. I want to play around the amount of lard – I think next time we’ll do a quarter lard and three quarters butter. I also will cut the butter, or at least most of it, in first, as the lard is ridiculously easy to cut in. I’ve now tried lard in both a pie crust and a batch of biscuits. It does make your pastry incredibly flaky, but it also imparts a certain animal taste. I like it in the chicken pot pie, but not so much in biscuits. Toasted for breakfast, smothered in butter and Grandma Kathy’s blackberry jam I didn’t notice the flavor as much, admittedly. But I also am not that much of a fan of meat or the taste of it in general. I like bacon and sausage, but I mostly prefer the smoky flavor and the spices involved more than anything else. Although the flavor, combined with the larger size biscuits Edie cut out definitely kept me to eating just two biscuits with my soup and salad. The salad is worth mentioning. We had some goat’s milk brie and some toasted pecans that she thought would pair wonderfully with dried cranberries and the arugula I always seem to have on hand and work into dinner a few nights a week. Only we didn’t have any dried cranberries on hand. What we did have though, was some cranberry spread I’d made last year. I proposed the idea of using it as a basis for a dressing. So, down we went to the shelves in the basement where all things canned, pickled and jammed are kept and grabbed a jar. 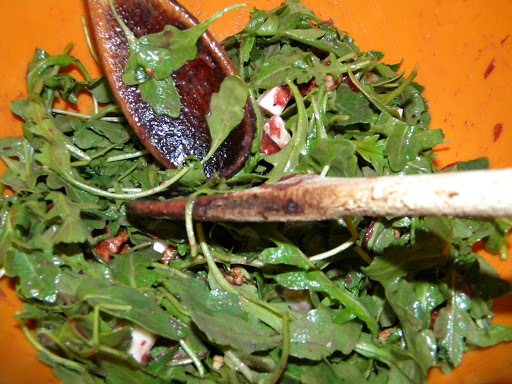 We thinned it with olive oil, lemon juice, honey and water until it was just the right consistency, then tossed it with the greens, cheese and nuts. It was a darn good salad. And she did a most excellent job on the biscuits too. 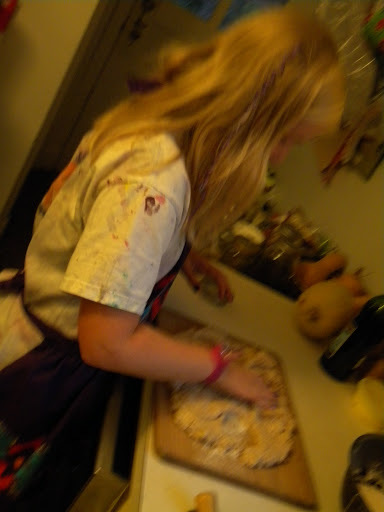 Definitely some proud mama moments as I watched my little foodie go to work in the kitchen last night. As for the dressing, I think the liquid proportions with the exception of the honey ended up being equal. Using a fruit spread (or jam) as the basis of a salad dressing seemed pretty genius to me and I’m now brainstorming ways of using up my stash on the shelves down there. At some point I might measure things and write out a real recipe to share, although I definitely will be making a batch of cranberry spread again this year and if you like cranberries, I recommend you make some too. It’s easy and oh so good. Reminder – the cookbook giveaway is still open, so get on over there and enter before this Thursday, October 25. What lovely quality mama/daughter time! I could eat a salad like that all day every day–I bet it was tart and sweet and MMMMM! I remember spending some Saturday mornings at my Aunt Roni's, “helping” her fix biscuits, my “nosey rosey” nose splotched with flour. I was younger than your girl, whom I suspect was a real help! I understand her aversion to he-who-shall-be-nameless! If you have a minute, I wondered what brand of lard you used? Thanks for your comment on my Mexican lasagna post. I don't think I'd miss the hamburger in that recipe one bit. The corn and beans added such great texture. Are you familiar with the work of Laurie Colwin? I love her books and, though your writing is uniquely you, I feel a delightful similarity between you two writers. Currently I am using lard a friend gave me that she rendered herself from some locally raised pork. In my freezer, I have a bag of pork fat some friends who also raise pork gave me that I need to render. I hear commercial lard is much different than the type you render yourself. A good biscuit is a reason for jam or honey. I slather it on. Yum. Glad you reminded me. It's that time of year: soup and bread. I make a pretty good biscuit and it's time to do it again. I love blue or gorgonzola cheese in my salad.